It will come as no surprise that I’m a big fan of Ron Gilbert’s work. I’ve played and reviewed a few of his games on this blog in fact, including the special edition of The Secret of Monkey Island, Monkey Island 2: Special Edition (yes, I did play the originals), Deathspank, The Cave and Day of the Tentacle Remastered (Ron Gilbert and Gary Winnick actually worked on early scripts of the game and why wouldn’t they? They were the creators of its predecessor, Maniac Mansion). A commonly recurring theme in my reviews however (at least with respect to his more recent games prior to Thimbleweed Park) is that I was really missing a decent point ‘n’ click adventure from the man. Yes, Deathspank and The Cave were fun and often hilarious, but they really weren’t my favourite genres (i.e. a hack ‘n’ slash RPG and platformer respectively). Well, in November 2014 my prayers were answered and Ron Gilbert and Gary Winnick (Lucasarts legends and creators of Maniac Mansion) happened to launch a Kickstarter project to raise $375,000 for a retro-styled point ‘n’ click adventure game called Thimbleweed Park; they easily met their funding goal and then some, raising $626,250 overall by the end of the campaign from 15,623 backers. So what kind of game is Thimbleweed Park? Well, as already mentioned it’s a retro point ‘n’ click adventure so it’s not exactly anything new in terms of genre, but it’s a new story, with higher definition music and voice acting. Basically, if you played early Lucasarts adventure games during your youth (during the late 80s and early 90s) you’ll feel right at home when playing this game – it’s even got the same interface. Younger adventure gamers and younger gamers in general might find the interface a little bit fiddly however. Thanks to the likes of Mark J. Ferrari (really, you should check out this HTML5 Colour Cycling Art Gallery sometime) and Octavi Navarro, you’ve got some really gorgeous background pixelart. Most of the game has decided to adopt a retro feel but the soundtrack by Steve Kirk, is one area that hasn’t, at least with respect to its fidelity. I’ll talk about it more once I finally get to the soundtrack review for the game, but Kirk is no stranger to scoring game soundtracks and this one is no slouch sounding like a fusion of Peter McConnell’s previous work on Lucasarts games, James Bond soundtracks and 70s prog rock (think Jeff Wayne or Yes). While there aren't any big-name voice actors the ones involved tend to be quite experienced and you can tell. The game has trademark Ron Gilbert humour (speaking of trademarks, he really likes placing them in each of his games); there’s plenty of breaking the fourth wall and frequent references to the 1980s and adventure gaming in general. Although the way that sheriff-a-reno talks can get quite annoying at times. How long it takes to complete an adventure game isn’t the be-all and end-all; Day of the Tentacle and Full Throttle only take a couple of hours to complete each (if you know what you’re doing) and they are among my favourite games of all time. Having said that though, it took me a whopping 15+ hours to complete Thimbleweed Park so if you measure a game’s value by how long it takes to complete, you won’t need to worry with Thimbleweed Park. Thank God they added quick travel in this game. It’s funny, because only recently I’ve been watching Double Fine Adventure!, the documentary about Broken Age’s development and in it, Ron actually mentions how he encourages the ability for users to quick travel through adventure games… well at least I think he said that, I can’t actually find the clip…whatever the case, it’s in the game, I like it, it’s good. The game has Steam Trading Cards and Achievements. Hurrah! For those of us who are veteran Lucasarts adventure gamers, this game fits like an old glove thanks to its adoption of an interface identical to the SCUMM verb-object interface of yesteryear. Nostalgia overload. If you ever get the game, dial 5742 into a phone 😉. Due to the similarities between this puzzle and another puzzle on The Secret of Monkey Island, I figured you would approach it the same way. After attempting to approach it the same way and it failing, I figured there was nothing important left to do in that direction. Since I had already entered that area and solved a puzzle, I figured there was no more reason to go in there to solve yet another puzzle. Since the game actually mentioned about a lot of red herrings in the inventory, I assumed one particular inventory item was just sprouting BS, especially considering I already used said inventory item to redeem something (which ended up being an actual red herring). The characters in Thimbleweed Park have neat TODO lists that indicate to you what you need to achieve next. At the beginning of the game, you’re given frequent reminders of what you need to do next for each of the characters, however towards the end of the game there is hardly anything to go on except a vague “find a way into such-and-such a place”. Consequently, I didn’t really know about this other place I needed to go to first, especially considering it’s normally hidden. Maybe I’m just losing my edge but I was quite annoyed nonetheless by this particular puzzle. However, this was the only hiccup I had. All the other puzzles I managed to solve reasonably smoothly (I did get stuck a couple of times before that, but coming back with a fresh mind the next day usually resulted in a solution being found). Sometimes it seems like the audio cuts out or decreases too much in terms of volume that I can’t actually hear what the characters are saying. Thankfully, I play with subtitles but if you don’t, well you could miss on some dialogue. I did come across a couple of bugs but they weren’t game-breaking – one of them involved an objective re-appearing in a journal even though it was completed, but yeah, as I said, I didn’t encounter any game-breaking bugs. Some of the references will fly over the heads of those that didn't play games in the late 80s and early 90s. It’s perfect for those that do remember (like me) but might alienate those that don’t. You get to control multiple characters in this which means you can interrogate the citizens of Thimbleweed Park multiple times. While it’s good to see that there has been some effort made in giving different conversation options and conversational styles for each character, it’s not always the case with some characters (especially agents Ray and Reyes) saying the exact same lines verbatim. It’s a minor thing though, really clutching at straws here. If you’re a Lucasarts adventure game fan, this game is a must-buy. If you are into 80s pop culture in general, this game is a must-buy. 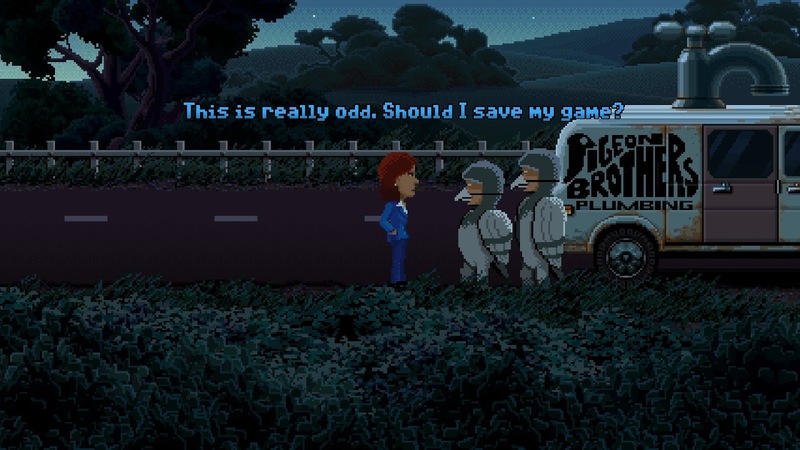 For everyone else, if you’re looking for a humourous trip back to 1987 along with a mystery to solve, I don’t think Thimbleweed Park will disappoint; as Ron Gilbert and Gary Winnick put it on their Kickstarter page: “It’s like opening a dusty old drawer and finding an undiscovered Lucasarts adventure game you’ve never played before.” That’s Thimbleweed Park in a nutshell. Is the game worth $19.99 USD? : Yes. Okay, it’s about $26 AUD for a retro point ‘n’ click adventure game but this isn’t just any point ‘n’ click adventure – it’s friggin’ Ron Gilbert and Gary Winnick we’re talking about here… these guys were responsible for some of the very first graphical point ‘n’ click adventures – and the game is pretty awesome as a result. It’s also not a short adventure game. Worth the money.